Do you love easy to make recipes that are perfect to make ahead and help you reach nutritional goals for the busy workweek? 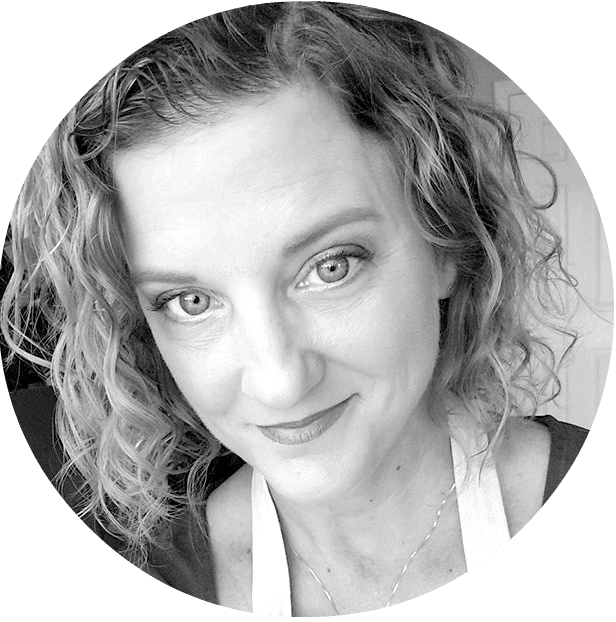 I LOVE easy to make recipes that are perfect to make ahead and help me reach my nutritional goals for the busy workweek. 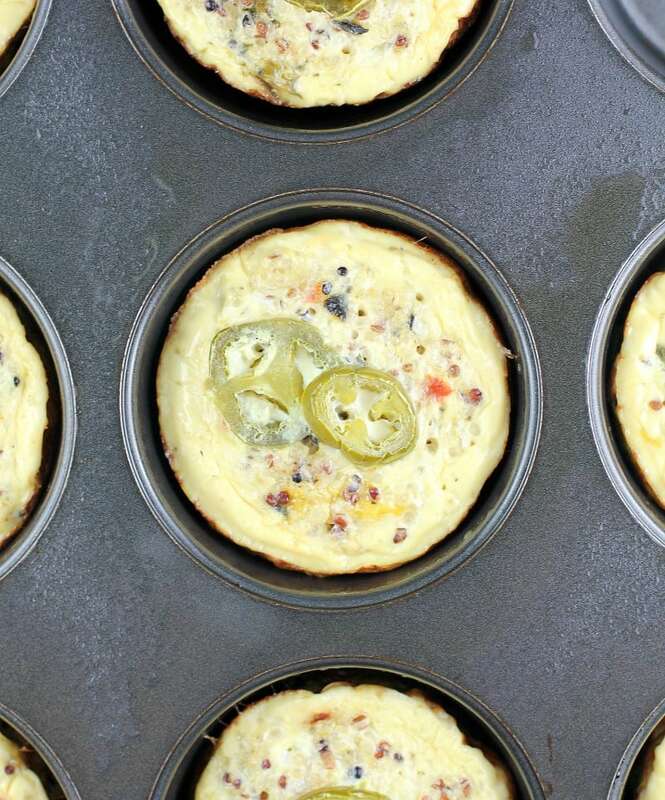 These quinoa egg muffins are my newest best answer to what I feel is a consistent problem …breakfast meal prep. See, I will start out a week fully intending to have, say, smoothies all week. But then I’ll hit snooze too many times, go for a run, then run just a couple minutes late enough getting out the door that breaking out the stuff and machine and such to whip up a smoothie just doesn’t happen. So my answer is first, admit I have a problem …I need breakfast already done. And second, come up with a flexible solution so I don’t get tired of it. Keeps for the work week. Heat to eat for 30 seconds in the microwave. FILLING fiber and protein keep you satisfied for hours. Flexible recipe so you can change up the ingredients however you like. So that last bullet is key: This recipe is FLEXIBLE. I already have like a dozen variations in the works. But they all center around the same basic recipe. Also, I have made egg muffins for ages, but this is the first time I have added quinoa. 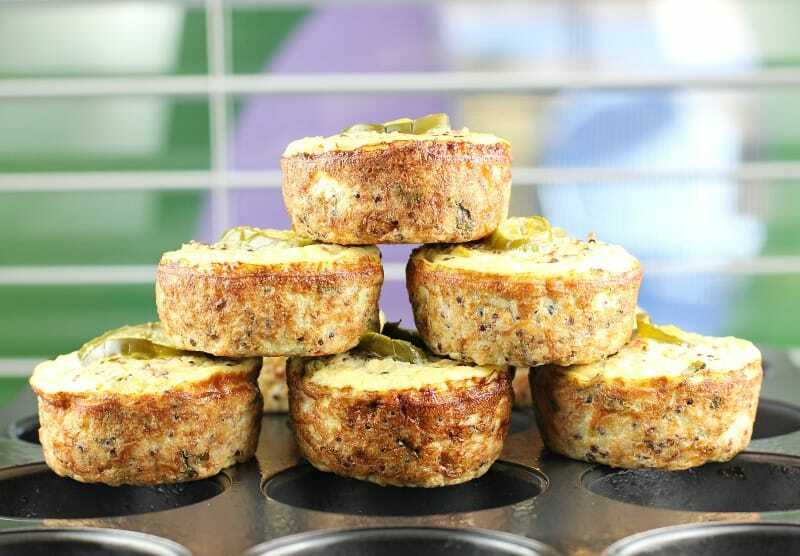 It really is the missing link because it gives these egg muffins structure and support that my previous recipes haven’t had. The quinoa also absorbs moisture, so this is the first recipe I’ve made where they are just as good at the end of the week as they are at the beginning. Aka PERFECT for meal-prep. 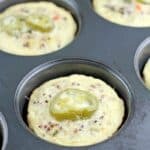 Follow that formula and you will have yourself yummy, healthy, gluten-free quinoa egg muffins for everrrrr because you can get creative and totally have your way with them. 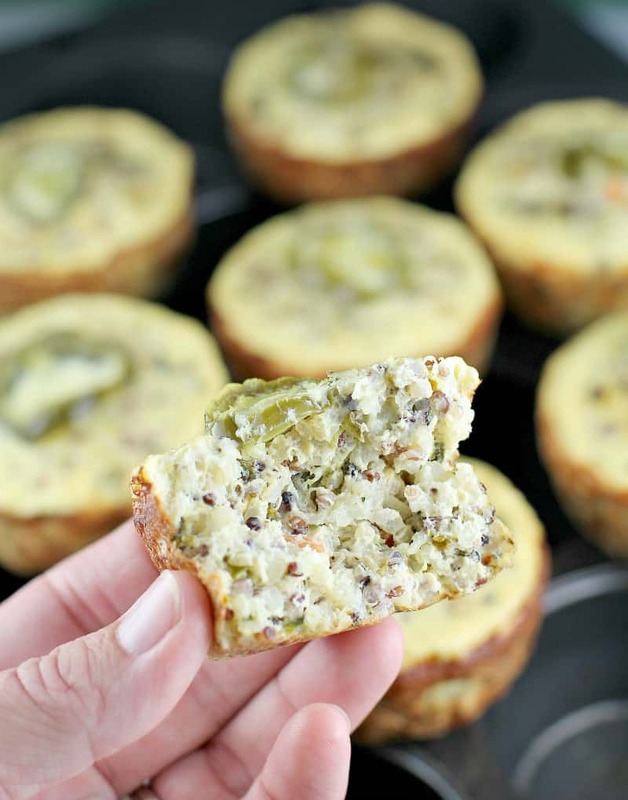 In this recipe, my first quinoa egg muffin to give to the world, I featured one of my all-time favorite ingredients, poblano pepper. I LOVE poblano peppers, I love their flavor, just the right amount of heat, SO SO good. First we roast a giant, gorgeous poblano pepper along with a colorful and clearly healthy red bell pepper, and between the two of them (and quinoa, egg, and cheese) we have all the flavor we need for our breakfast. Roast the peppers under the broiler. Let the peppers steam in a bag and cool, discard the skins and seeds, and chop. 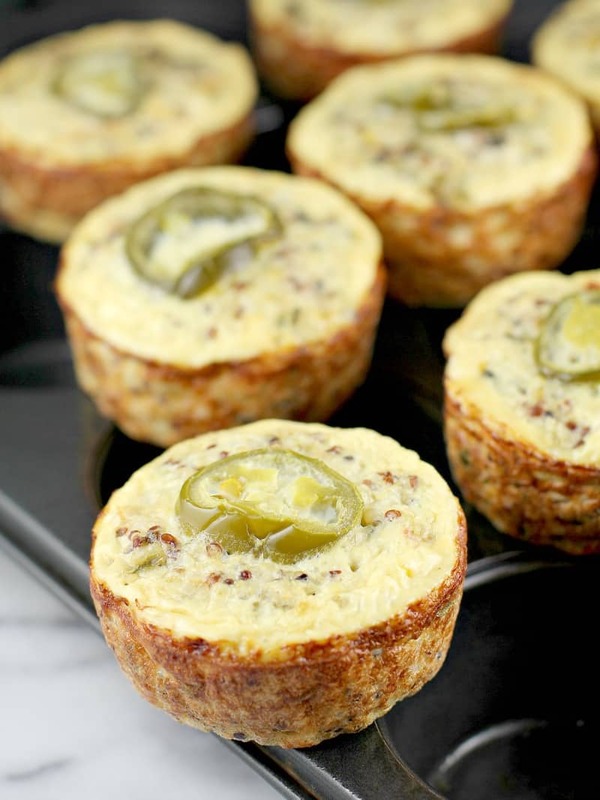 Combine all the ingredients and distribute in muffin tins. That’s all that you have to do and everything is super easy. I even included my little trick for making fail-proof quinoa: BOIL. I never ever ever cook quinoa according to package directions. Instead, I boil my quinoa for 15 minutes in a pot of water as if I were cooking pasta, then drain and let sit, then fluff with fork. Just like in my Light and Lemony Quinoa Salad, this is a great little trick to make life easier and help you get eating quinoa more often because it literally is a magical little grain. So that’s it kids, a delicious and healthy option for those of use that need easy solutions in our lives. Healthy, gluten-free, vegetarian, filling, and loads of good nutritional stuff and goodness. 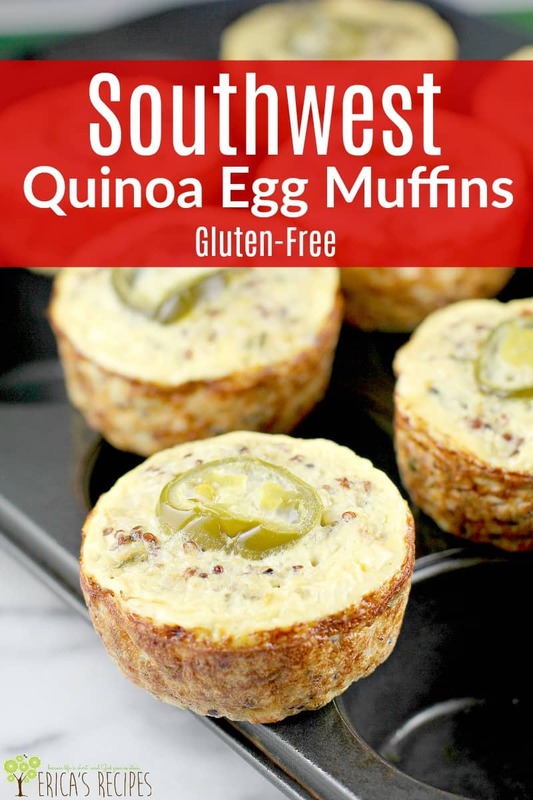 Quinoa egg muffins with southwest flair! 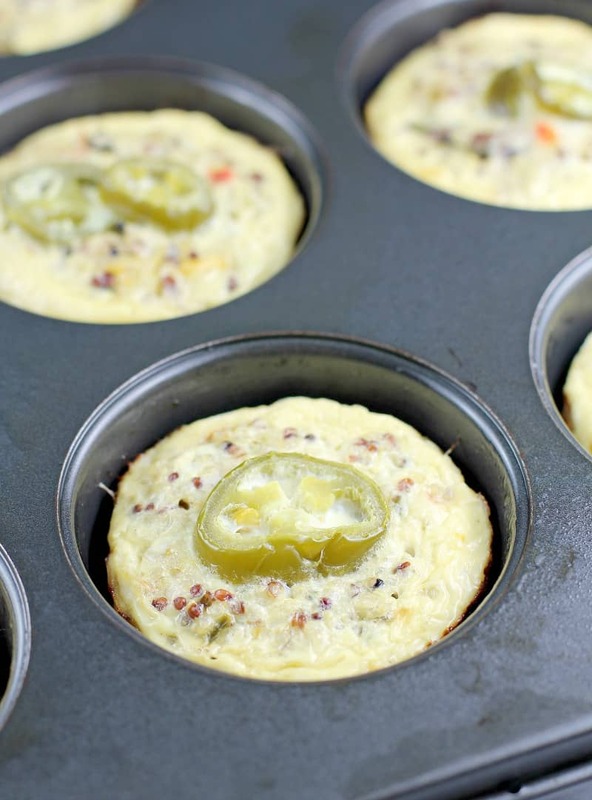 Fluffy, tasty, filling, quinoa egg muffins with a southwest twist and super tasty fair. Heat the broiler to high heat. Move the oven rack to the first slot under the broiler. Put the peppers on the rack and roast, turning every 4 minutes, until completely charred and softened. Transfer peppers to a resealable bag, seal, and let steam 10 minutes. Once cool enough to handle, discard the charred skins and seeds, and finely chop the peppers. Set aside. Put the oven heat to 350F. Rinse the quinoa in a fine strainer for a minute to wash off the sapronins from the grains. Add the quinoa to a pot of boiling water and boil 15 minutes. Drain completely, and let sit for 10 minutes to cool a bit with the lid off to allow for evaporation. In a medium bowl, whisk together the eggs and egg whites. Add the remaining ingredients. Distribute to 8 tins of a muffin tin sprayed with cooking spray. Bake at 350F for 25 minutes or until muffins are set and golden around the edges. Transfer to a storage container in the refrigerator. Yields 4 servings, 2 muffins each. For the cheese, this is one of those recipes perfect for using up all the little bags of leftover cheeses in your refrigerator. I have even used Italian cheeses in this recipe with great result. I live in Florida and used a Key West seasoning blend that I found at my grocery store. Alternatives could include a cumin-based southwest seasoning blend or salt-free garlic and herb seasoning.